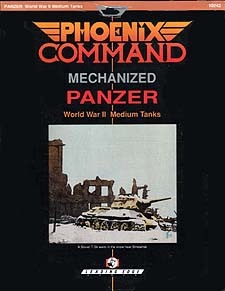 This supplement to the Phoenix Command Mechanized Combat System provides the Status Sheets for the primary Medium Tanks of World War II. Included are versions of the German Pz IV, including the short-barrelled Pz IV-F1, the long-barrelled Pz IV-F2, and the high-velocity Pz IV-H; two models of the powerful Pz V Panther; the Soviet T34 and the T34/85; and the US M4A3 Sherman with both 75mm gun and high-velocity 76mm gun. In addition, special rules for Vehicle Systems specific to World War II Tanks and Second Shot Accuracy are presented, along with full Vehicle Descriptions.